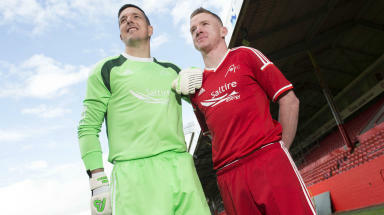 Aberdeen have launched their 2014/15 shirt, with a return to the 'classic' club crest. Aberdeen have announced a new seven-figure sponsorship deal with offshore drilling specialists, Saltire Energy. The club have also launched a new home shirt for the 2014/15 season, with a return to the 'classic' club crest. Since 1986/87, Aberdeen's badge has incorporated the traditional ball and goalposts, framed in a circular crest, with the club's founding year of 1903 incorporated underneath. Since 2005/06 the club have also incorporated two stars into the logo, representing victory in the European Cup Winners Cup and European Super Cup. For the first time since the 1985/86 season, Aberdeen have returned to the more simple ball and goalposts design, first worn during season 1979/80. Speaking about the new sponsorship deal, Aberdeen's Vice Chairman George Yule told the club website: "We are absolutely delighted to have secured this partnership with Saltire Energy, an organisation that already enjoys a close relationship with the club through supporting of several initiatives over the years. "In addition to Saltire's involvement with the senior squads, they are also going to support all of our youth development teams which of course are where many first team stars of the future can currently be found."